What happens is that someone FGITWs a mini-answer as a comment on the question, diluting the value of the actual answers. Sometimes no answers appear at all, and the OP's question has been answered by a comment. So then what? It breaks the whole Q&A model by turning questions into flat forum posts or chatroom messages. Stack Exchange was invented to get away from this messy model and instead create a system of Questions and Answers. Period. Okay, well, don't then. Let someone else do it. Then posting it at all could be damaging to the OP. Watch other answers, learn a bit, then post an answer later if you feel you're surer about your idea. Invite him/her/it to a chatroom. Give it away in bounties to answers elsewhere that you feel are outstanding. If the question is off-topic then it is off-topic. It should not be answered at all. Writing an answer in comments both enables the naughty OP and creates a spasmic mess of anti-Q&A, surely the antithesis of Stack Exchange. As of 2019, this behaviour is extremely widespread. I often see more answers-in-comments than answers in the actual answer section. 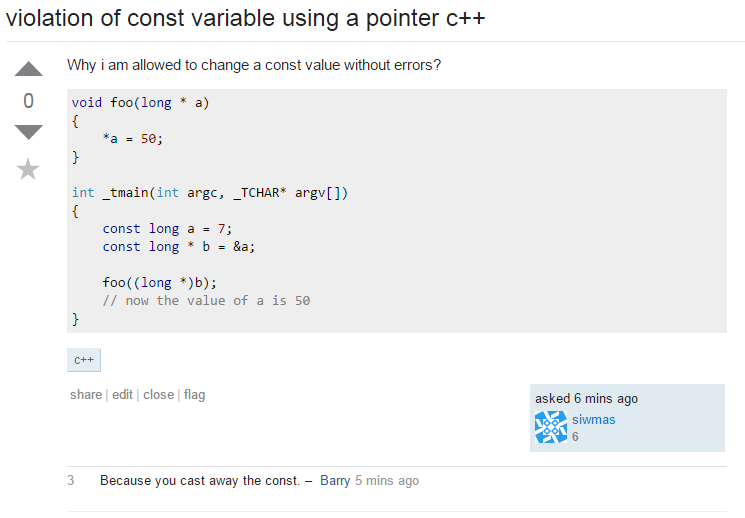 Have we all forgotten why Stack Overflow was created? Have we forgotten the very purpose of a strict, peer-reviewed Q&A format? Are we all that desperate to "help", even on what we deem to be off-topic or trivial questions, that we are willing to sacrifice everything valuable about this site that set it apart from the others? Fortunately, other network websites have started taking this seriously. Picking just two examples off the top of my head, Interpersonal and Workplace moderators routinely remove answers-in-comments and remind people to stop posting them. Even on SO we have "avoid answering in comments" under the "add a comment" tooltip, but this goes completely ignored and flags (last time I dared attempt one, anyway) are not only rejected but also discouraged. I'd like us to start being firmer about this on Stack Overflow. Perhaps a special flagging reason for comments? Although I'm loathe to begin removing "useful content", this is not the correct place for them. At all! A "half-answer" like this can be quite valuable as a comment. It can provide a head start toward a full answer by someone else, especially in cases where the derivation and content of a complete answer would be non-trivial. Your list of objections seems to presuppose that there are other people waiting in the wings to answer the question, unassisted, but for non-trivial questions, this might not be true, and a complete answer may emerge only as a result of someone taking the hint in a comment and running with it. Therefore, I think that such comments should be neither flagged nor deleted until their content is completely subsumed within an answer. At that point, I think it would be fair to flag the comment as "Obsolete" and for its author or the mods to delete it. How should I handle questions which are answered in the comments?